NetSpot is a simple and accessible wireless survey tool for Mac users, which allows collecting, visualizing and analyzing Wi-Fi data using any MacBook. 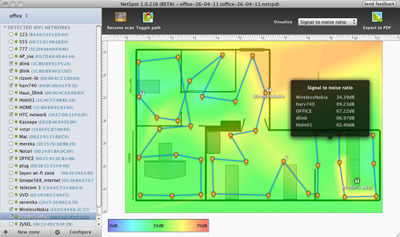 NetSpot can visualize your wireless network by building a visual Wi-Fi map. It will let you see dead zones without coverage and place hotspots (Access Points) correctly. Using the visualized map of collected wireless data you will also see channels' load and will be able to decide how to optimize your Wi-Fi site better. NetSpot is a powerful analyzer of Wi-Fi coverage. Just in a couple of clicks you can load your area map, point your location on the map and NetSpot starts collecting Wi-Fi data around you. It will gather all the needed information for radio signal leakages analyzing, noise sources discovering, access points effective location, etc. You can also use NetSpot as a powerful wireless network planning tool. Load a map, collect wireless site survey data, build a heatmap of your network and you are ready to build the optimal configuration of a new Wi-Fi network and wise radio channels usage with minimal signal to noise ratio.